Although I don't usually make note of speed in submitting results, it is interesting to see how fast some report results. K8JQ submitted 3 good readings 4 minutes after the end of the 160m run. N8OB submitted 3 good readings 9 minutes after the end of the 160m run. N8OB OH I never saw so much freq movement on 40M as I did tonite. It scared me with trying to take a reading. Lots of fun as usual. WA2DVU SNJ good signals to NJ - 160 was the weakest though - s2, others were s9 - 10/9. WM5Z NM Receiver is an FT-950AT stock. The software I used is FLDigi running in Frequency Analysis mode. My antenna is a multi-element dipole. The signals were very good from K5CM. Very strong on 40 meters equaling around S9 +20. Nearly the same for 80 meters at S9 +10 and 160 meters was right at S9. Nice job! hope everyone did well. This is my first FMT with this group. W2FD WPA Did not hear W6OQI on 40 meters--W6OQI signal on 80 meters weak. Frequency measurements made to nearest Hz.using TS-450S only with TCXO,CW/Reverse CW, 1Hz. frequency step and 10 MHz. WWV for correction. Thanks for your efforts producing the FMT Test. WA1ABI RI Nil from Marvin tonight on 40m - that's a first. Not much QRN for mid-August. Thanks Connie and Marvin & 73. K6HGF LAX Hope I did better than last time. Thanks for the FMT. WA4FJC VA Could not hear anything on 160 M again this time. Signals on 40 and 80 were good with some slight fading here in VA. Used HP 3586B. Lots of fun. W1PW AZ On 160 meters, some LID tried to jam the FMT signal but it didn't work. As usual, SL handled the QRM with no trouble. The WC 40 meter signal was not detectable in AZ, and the 80 meter WC signal had a tremendous amount of Doppler during the test. This was my first FMT using the Trimble Thunderbolt for frequency calibration. I hope it helped. Thanks Connie and Marvin for running these tests! K5BTK MS The conditions were the poorest yet - never heard a trace from the west coast. A cockpit blunder limited me to the last 40 seconds of the test on 160m. Thanks for the fun! W6OQI LAX 40 meter signal was S8, 80 meter signal was S9 with a LOT of Doppler. 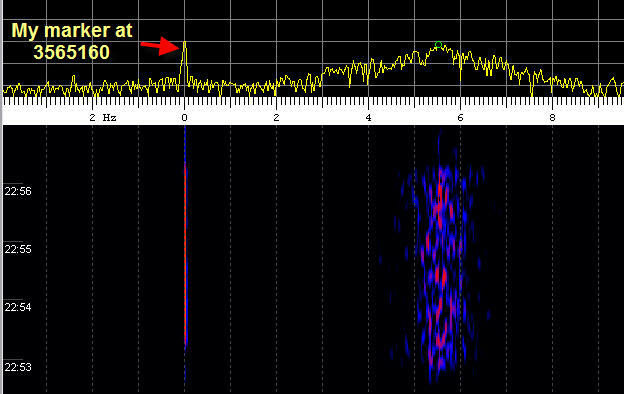 160 meter signal was S7 with minimal Doppler. Sorry my 55 year old Viking One intermediate power amplifier failed to work on 40 meters and I was not able to transmit the West Coast 40 meter FMT last night. W9TJ IL Ionosphere was nervous. Only stability I saw was on 160. No West coast signals on 40. K6APW/7 OR At local sunset only heard 15 seconds of 160M call up buried in noise. Heard nothing at all of WC 40M transmission. Both 80M measurement periods had very unstable path. W3JW VA Signals were moderate to strong and the band conditions were quiet (for Summer!). Plenty of doppler to cause discontent, particularly on 80 meters. I guess I will have to lend Marvin my Ranger II---it's only 46 years old and in the "prime of it's life"--- Hi. Thanks to you both for a great string of enjoyable FMT's. KD2BD NNJ Many thanks for another FMT! Connie's signals were fairly weak on 80 and even weaker on 160. W6OQI's signals on 80 suffered some interference from a faulty street light. 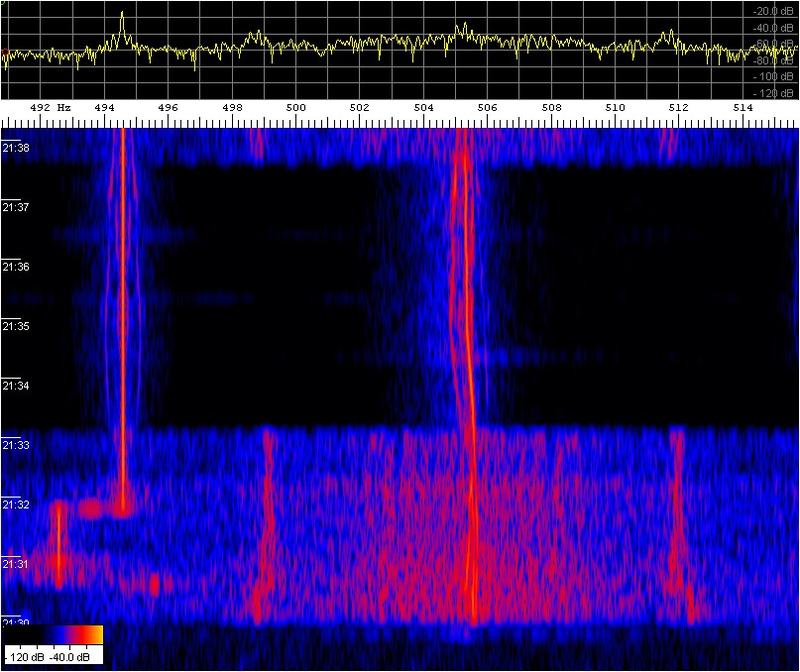 About 0.3 Hz peak-to-peak of Doppler shift was observed on all signals, with the sumbitted results being averages of all measurements made during the FMT period. K1GGI EMA Nice sig on 160, S2-3, some qrm. Other sigs were spread over many hundred mHz. Thanks Connie and Marvin for all you do. K5CM OK I heard Marvin briefly on 40 meters. Good signal on 80 meters. WB9FIP WI It would seem that I have offended the propagation gods. As I watched in dismay, the fickle ionosphere reeked havoc on Connie's first transmission, shifting it 200 millihertz lower over the first 90 seconds, and splitting into three distinct components. Then, both Connie's and Marvin's 80 meter runs might just as well have been spread spectrum signals for how they appeared on the waterfall. I decided to apply different statistical signal processing methods than traditional to derive my estimates. And, keeping my fingers crossed too. When I saw a few bits and pieces of Marvin's 40 meter transmission pop in and out, I thought a sacrifice to the propagation gods might be needed to restore harmony, but alas, as we have sadly learned, 'twas only Murphy at work. Hope the patient recovers soon Marvin!